Dad delighted in being older than this lava field. Dive Journal: After flying from Honolulu to Kona, Dad and I took a slow-paced tour counterclockwise around the Big Island. 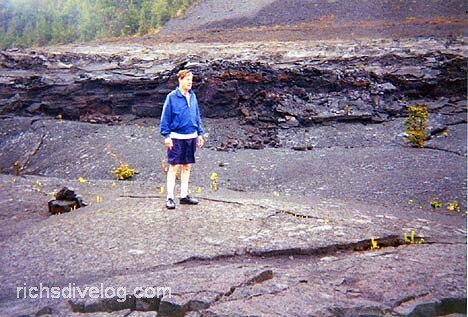 We stayed two nights at Volcano National Park and enjoyed several great hikes across still smoldering craters. Dad was fascinated with the idea that he was older than the ground he was walking on. We also stayed at a little bed and breakfast near the town of Puuili on the northern coast. This place was tucked up on the side of Mauna Kea mountain in a macadamia nut farm. It was a place Dad would never stay at, and so I enjoyed taking him out of his element a bit. We finally completed circle-island and set up camp at the Royal Kona Resort, like respectable tourists. I can't say enough good things about Dive Makai. I found Lisa Shockley just a delightful person to dive with, full of energy and enthusiasm and a child-like fun in her work. Our dive started just slightly offshore and to the south of the marina. The island slopes rapidly down from the shore to around 120 feet depth, and these slopes are teeming with fishlife. The visibility is outstanding. Lisa assists us in locating a somewhat uncommon bicolor anthias at around 100 feet. This is the most common of the Hawaiian anthiases but still a treat for me to see. She also points out three different bandit angelfish to us, another endemic Hawaiian species. There are great numbers of more common Pacific fishes as well: bird wrasse, peacock grouper, goatfish, bannerfish, pinktail triggerfish, and scorpionfish. Eventually, Lisa leads us towards the rocky shoreline. We enter into a short underwater cave parallel to the shore. The first "room" is a rocky cavern where we discover a lovely rosie colored cowrie shell amid the rubble on the floor. The second cavern is smaller and continues to narrow down in the back. As we enter this second chamber, we meet squarely with a medium-sized green sea turtle centered in the room. With nowhere to escape, the turtle can only hover mid water and let us take a look at him. What an encounter! Nearing the cave exit, I feel the increasing tug of the surge. Remembering Lisa's dive briefing, I wait for the surge to be in my favor, and then fin out of the hole and duck to the left. I feel like I've been flushed! I have hardly any air left nearing the end of this dive. This is probably due to the depth, the 72 ft3 tanks, and my previous regulator adjustment. After the dive, the boat motors slowly northward for our second dive. Lisa yells out to stop, however, and we encounter a school of spinner dolphins! We are all entertained by their antics, including lots of aerials spins while we applaud. They actually seem to enjoy performing for us.